I had so much fun wearing this outfit. The swingy nature of this thrifted skirt made it so enjoyable to wear that I resisted twirling around at every moment. I paired the skirt with a simple baseball t-shirt in a berry color to offset up the vintage vibe of the skirt. This work week has been pretty relaxed for me so I'm looking forward to entering the weekend with the same mindset. What will you be up to? What a cute combination! I am in love with your skirt! Totally twirl-worthy! Have a great weekend! 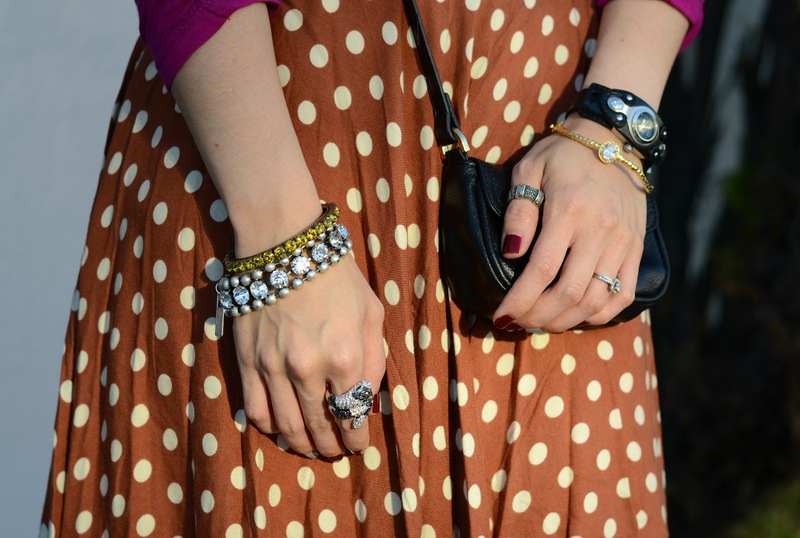 Love your snake ring and polka dot skirt. I don't have any plans for this weekend outside of Saturday morning for sure, so we'll see! I absolutely LOVE this polka dot skirt! What a great find! This outfit is adorable! I really like that skirt! I love the colors in this outfit, magenta, rust and red--so unexptected and wonderful! Low key weekend here to after a crazy week at work. I hope your weekend is great! I love casual baseball tees- especially when dressed up a little bit with a skirt! 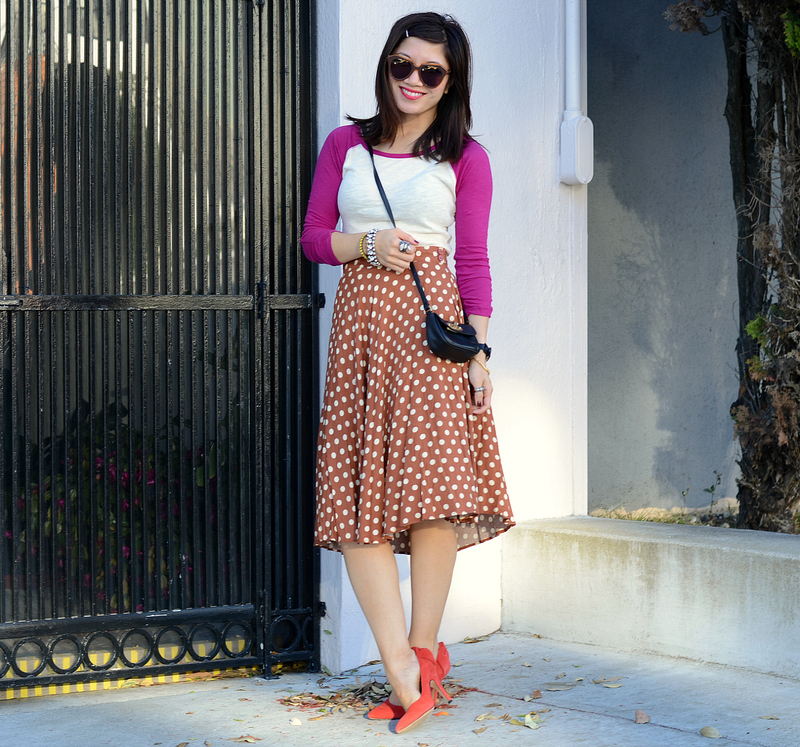 <3 the juxtaposition of a baseball tee with a swingy skirt! Super cute polka dot skirt and I love that you paired it with a baseball shirt! Such an adorable outfit – LOVE this look! What a great skirt, and I love how you paired it with the baseball tee and heels. completely obsessed with that skirt! your adorbs. Really cute outfit- I always just love polka dots! Skirt definitely looks like such fun! I love this take on the baseball tee. The color is so fun and really pops! Love your outfit and the color combos! So cute! Thanks for posting on my blog! love this tomboy yet girly look! very nice polka dot skirt - you look really adorable! You really should try a more romantic look, I think it would be great on you. What do you think? Loving on all the color in this post! love the polka dots and the shoes! xO! You look so pretty in this! I love the baseball top, it contrasts really nicely with the feminine skirt. I love this skirt! It seems very retro and vintage. So cute! I'm so obsessed with this outfit! I love all the colour!! You look gorgeous! This is such a fun and unexpected color combination! what a cute skirt and top! i would've never thought to pair them together. it looks SO good!